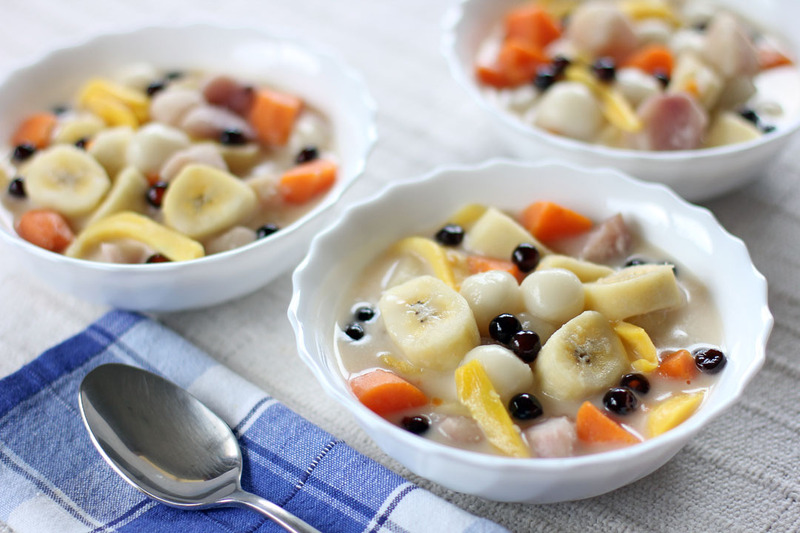 Guinataang Halo Halo or Binignit is a Filipino hot dessert / snack dish that is made out of different root crops (sweet potato, taro, yam and cassava), cardaba bananas , tapioca pearls, galapong (rice flour dough) and jack fruit served in a sweet coconut sauce. This odd combination is where it got its name from because when it is translated it means “different items cooked in coconut milk”. If this is your first time being exposed to this dish it would look very weird because of the odd combination of ingredients, even South East Asians that I know never seen nor tried such dish but trust me this is really good and each ingredient works well with each other. Having said that I was intrigued on why even South East Asians or even Chinese have that reaction? Is this only found in the Philippines, are there no similar variations of this outside of my home country. This then resorted to a lot of Googling on finding out where it did originated but after several days I still got no answers. What I can only offer is best guess based on my culinary experience hence the most possible inspiration of this dish might be from the Chinese dish called Tangyuan. I had tried Tangyuan before and there is a big resemblance with the Filipino version as they both use rice balls served in a soup. 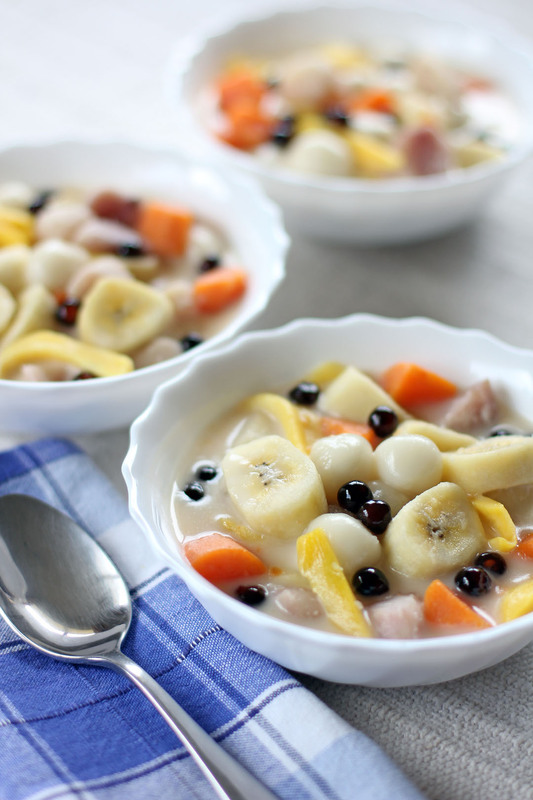 Tangyuan though is not mainly considered as a dessert as this can be prepared differently based on region. The Northern Chinese prefer their version to be filled with minced meats and vegetables while the Southern Chinese prefer it to be sweet where rice balls are either not filled or filled with red bean paste in a sweet soup. Having said that the origins of most of the Filipino-Chinese dishes are of the Southern China region hence they might have bought this recipe but adjusted to the local ingredient and taste. Plausible? Up to you to decide but if there is anyone out there who knows the history of this dish let us know and share the wealth of information that you many have. In a mixing bowl add the glutinous rice flour, pour water bit by bit while trying to form a big ball of dough. Once it is firm enough to shape and does not break easily stop adding the water, do not exceed 1 cup of water. Pinch a small amount of rice dough and make a small dough roughly 1.5 cm in diameter set aside and do it with the rest of the remaining dough. In a pot add coconut milk then bring to a boil, turn the heat to low. Add taro and simmer for 5-10 minutes. The time here depends on the type taro used, if you used the small ones simmer only for 5 minutes, if you used the big ones (they tend to cook slower) simmer for about 10 minutes. Add jackfruit and sweet potatoes then simmer for 5 minutes. Add bananas, rice balls and sago then simmer for additional 5 minutes while gently mixing to avoid sticking. Now add the sugar and salt, serve hot or cold. This would be perfect for this kind of weather. This is a great merienda for a rainy afternoon! Get a hot bowl of this, curl up in a couch, watch the rain trickle down the windows. Usually my servings are for around 5-6. Your delicious desserts never cease to amaze me Raymund. I’m familiar with the tapioca style, sweet taro “Tong Sui” (sweet water in Cantonese,) which my folks used to make. What I love about the Filipino version is the extra delicious bits. Jackfruit acquired taste (I know,) but with the coconut milk and the extra sugar & salt to balance it, those flavours go to a whole new level! Plus, it looks delicious as always too! I love coming here Raymund! You always have such interesting dishes that I’m not familiar with and that look SO good! This hot sweet looks delicious! What is the small dark fruit sprinkled all over? Those are black sago balls.